As Travel Agents - we all have something in common, We Love to Travel - discover new destinations, see new cultures, meet new people, and relax far away from home. Familiarization trips are a great way to discover new places. Finding the best FAMs can be very time consuming. There are so many sources - faxes, magazines, Internet, and so on. It is a real challenge, isn't it? Stop shuffling through piles of faxes, email files, web site after web site, and wasting countless unproductive hours on the phone looking for FAMs. 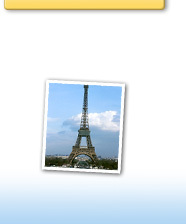 FAM News has been created to inform travel agents, like yourself, of the latest FAMs (Familiarization trips). As you know, travel agents are able to travel on FAMs at significantly reduced rates, often at least 50% discount! Now, you have the "One Source"- FAM News. We are here to Save Time, Save Money and Travel More! 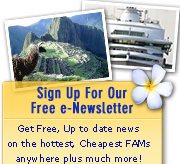 FAM News offers over 7,500 of the latest and greatest FAMs listed in each issue. FAM News is accessible only by subscribers. Click here to register for FREE access to one issue of FAM News. "I've been checking FAM News regularly - so many tempting possibilities - the hard part is getting away from the office! Great website!" Anna R.
" I cannot believe the FAMbulous deals for Travel Agents you send out each month with FAM News. Why wouldn't everyone in the travel business want to subscribe? Keep up the FAMtastic work. Your website is great!" Bill W.